If I Knew Then What I Know Now: Is it Possible to Make Money on the Internet? You will probably think I have gone off the deep end or, at the very least, laugh at me for getting scammed. I have started working (if you can call it that), in my spare time, at home on the internet. All I really do now is stay social on a web site and help new members succeed as I have. If you are interested in how it works, keep reading. If your mind is already blocked to this, I ask you to open your mind and keep reading. My wife started to college at 40 years old. She has an impressive resume already but never completed her degree. After her years in the Air Force, she worked on computer hardware. She debugged problems with the wiring and schematics. The work became volatile though and she ended up working in the health field where she excels today. My career path is computer software as a programmer. We started a small business (more of a hobby) building web sites for our customers. She was doing the logo and selling, while I was building the sites. I would ask her questions about the style of the site and her input was great. It brought something out of her though. She wanted to learn to program as I do. So she has dug in, with a full time job, two children, and me weighing her down. She is very busy but she is making progress in her computer engineering degree. She wishes she could go to school full time and I really want to make that dream a reality for her. I decided I would see how I could make money on the internet from my computer. It had to be easy and not very time consuming as I have full time job. I searched online and found there are a lot of things you can do to make money on the internet: write blogs that get popular (hard to do and very time consuming), write documentation or whatever a company wants you to through a contracting type site (time consuming and frustrating), and many more I'm not going to list. Of all of the things I tried, I found that Inbox Dollars was easy and not real time consuming. The site is set up so that you take surveys and get paid to do so. They have other ways of making money but I highly advise not doing those. Mainly because the next thing I found takes what they do to a whole other level. Before I tell anymore though I must warn you about protecting yourself from computer viruses. The only reason I even started looking at these sites online was because I have an easy way to deal with viruses. I have software that creates a mini computer on my computer. This is called a virtual machine that allows you to save a snapshot of it before going to sites that might give you viruses. It makes it easy to go back to that snapshot so that you never have to worry about viruses. The software was created by Sun Microsystems but Oralce bought them out so you will find the software on the Oracle site. The name of the software is Oracle VM Virtual Box. If you follow that link, download the version for your operating system and install. You will need an operating system to use it. Since MS Window's software costs money, I chose to use Ubuntu Linux. Linux is free and easy to use so long as you don't want to do anything but browse the web. Linux is becoming easier to use but for a user coming from MS Windows, there is a bit of a learning curb. If you click on the Linux link above, you should choose the right version based on your machine and save it to a location you will remember. Open the VirtualBox and when making a virtual machine, point it to that file. I could go on and on telling you how to install and run this but the instructions are already out there. Search for it if you need help. Although this is not foolproof as far as viruses go, it comes very close. I had signed up with several sites, checking out what they had that would help me make money. So naturally I started receiving lots of spam. You see these kinds of things in your email occasionally - make $5000 a month but, like you, I'm saying to myself yea right. With an open mind though, I visited one of the sites. The site has videos showing you how to make money. They actually train you to "green" a site that pays you $50 once you complete it. Until this point, I had not spent any money. My idea was to make money without having to spend anything. I mean how can you make money if you are spending it? Well it turns out that if you invest a little, you have the potential to make more. If I have peaked your interest, go to ProjectPayday and sign up. Check out all the videos and reading materials with an open mind. As a Method I referral, you purchase offers from companies with good products. These offers are heavily discounted for new customers. If you are not a new customer, you cannot purchase an offer. The offers are from all kinds of companies, but some of the known ones are Dell, Discover, Netflix, etc. Basically you purchase the offers on a trial basis and if you like it, keep paying the monthly subscription (or whatever plan the offer has). If not, follow the company's instructions set forth in their terms of service for cancelling. ProjectPayday sends you through their "Fast First Fifty" where you get paid $50 for "greening" their site. Then they tell you where you can go from there to continue this process. I lucked out and went to a site that has a very fair process for the next level, Method II. The site, where you continue working as a Method I referral, is called 1stDegreeFreebies. As a new member you introduce yourself and receive lots of welcomes from experienced members in Method II hoping to acquire you as their referral. These mentors are very helpful and truly are interested in helping you succeed. I, myself am one of these mentors. Mentors have several IFW sites to choose from and 1stDegreeFreebies has requirements of which sites should be greened before a Method I referral moves to Method II. As you green IFW sites in Method I, you acquire those sites for your referrals in Method II. These acquired sites are the ones the mentor's offer their referrals to green. After you green enough IFW sites as a Method I referral, you can start trading your IFW sites you have acquired as a Method II trader. The second part of the system is called Method II. 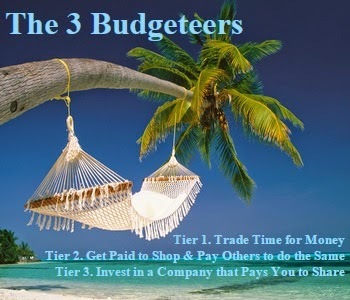 You are a trader hoping to acquire referrals to green your IFW sites for you. All you have to do is stay social on 1stDegreeFreebies and help new members and you will get a fair share of new recruits. In addition to staying social and helping new members, if you want more opportunities, post your successes on social sites like Pinterest, Facebook, Twitter, etc. ProjectPayday has good information on how to do this. You can view some of my success on my Pinterest board, Making Money Online. This has been an overview of trying to make money online using the freebie system. There is so much information about all of this that I am going to have to split it up into several posts. I will provide my experiences in each step and how I have become popular on 1stDegreeFreebies to acquire referrals. I hope you will continue reading and I hope to see you as one of my referrals in the near future! This is not a scam or I would not be writing about it. You do have to spend money to make money. Though I started this so my wife could quit her job and go to school full time, that is not realistic unless I really push to get a lot more referrals. In other words, the potential to make a lot of money is there but you really have to work at it. If you made it here thank you for keeping an open mind and I hope this helps you if you are interested in making a little extra money. I would appreciate it, if you are going to start this, if you will use my ProjectPayday link first. After going through the training there, I hope you will join 1stDegreeFreebies using my link as well. Once you join, I hope you will look for Welby, my name on that site. More than likely I will find you though :) If you follow my instructions and adhere to the warnings, you will make it to Method II where you can make easy money! has, but your blog is so amazing, lots of great articles. love this blog, I would recommend this blog to everyone I know. thanks for making a mind blowing awesome knowledgeable blog.